Ok I have searched but can not find exactly what is going on. The car has been flawless until recently and now it is just a tapping noise when I have to brake somewhat hard from freeway speeds. Brake calipers, shoes and rotors checked tight and ok. although I noticed that the drivers side screws are missing on the rotor. All the rotors and pads are being replaced next week. Just noticed they are below specs. Ball joints and swaybars tight and rubber stills seems soft. Muffler tight and in all the gromets. Subframe bolts there and tight. I have had 12 years of flawless driving and the engine still starts and runs like new. it is this annoying noise that I am wanting to get to just incase it is something that is serious. So now I am out of things to try and any help would be greatly appreciated. Noises are never fun over the net....your "tapping" is my thump, someone else it is a clunk. 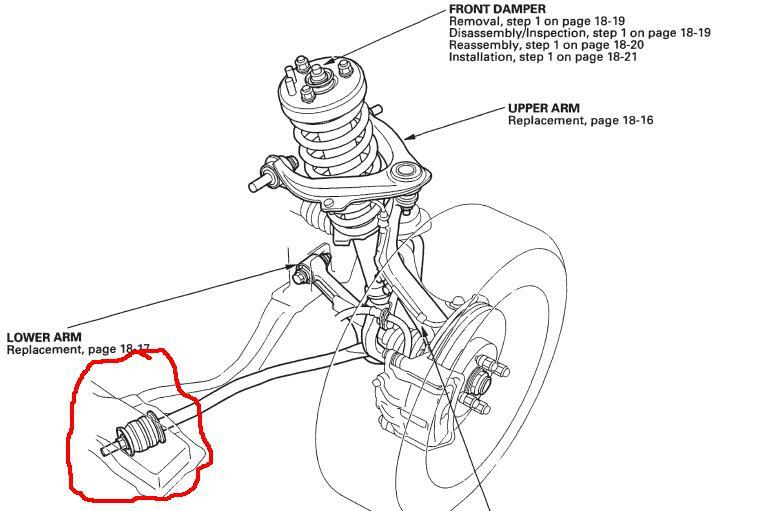 Have you looked at/inspected the strut rod bushings? This is the rod that goes from the lower control arm to the "beam" under the radiator. Last edited by poorman212; 06-05-2012 at 03:55 PM. Thanks for the reply, I have tugged on them and used a pry bar and they seem tight. Is there a better way to check some of this? I feel like I am just replacing a little heere and there and hopefully will find it.